Are you sick of trying to book crowded out-of-town trips, pools, and beaches for your summer fun? Why not try something different? Enter adult playgrounds. In recent years, adult playgrounds have proliferated in the metro, providing people with an exceptional alternative to regular vacations and without the usually arduous preparations. You may no longer be kids, but we bet you can’t say no to these 8 adult playgrounds in the metro – and these facilities also prove to be an ideal destination for your party or even indoor team building activities! Ball Pit Manila is reminiscent of the ball pits you used to play in as a kid. Inspired by the similar ball pit installations in New York and London, this recreational spot is technically the adult version of your childhood favorite that holds about 80,000 white balls to swim, jump, and rollover into. Flying Trapeze is considered the first and only full-scale rig in the country. Taking their cues from death-defying circus acts, this playground will make you feel as if you’re auditioning for a role in Cirque de Soleil. It’s the place to test your gymnastic skills in a fun and, of course, safe way! If you like to imagine yourself as the lead character in a mystery movie, Breakout Philippines lets you be the detective you always wanted to be. The pioneering escape room game in the country will test your problem-solving skills and teamwork through its set of immersive puzzles that need to be solved to escape the room. Mystery Manila is the first live escape room game in the country that transports you to various hair-raising mystery rooms where you can use your wits to solve mind-boggling clues and puzzles that will become your way out. Trade your usual summer vacation for an hour of playing detective in its four branches in the Metro. Housed in an 800-square meter warehouse, Trampoline Park boasts more than 70 trampolines that will get your adrenaline rushing and your body flying! Get active and have a lot of fun while doing so in the various activities it offers – basketball, volleyball, dodgeball, and Zumba – all while on a trampoline! A 2,000-square meter indoor park in the city, Jump Yard Manila is a place brimming with obstacles and activities that will have you playing like an American Ninja Warrior. It treats you to a zero-gravity experience with its trampolines, foam pits, and games that you’ve never tried before! If you thought ninjas only exist in the movies, Ninja Academy proves you wrong. 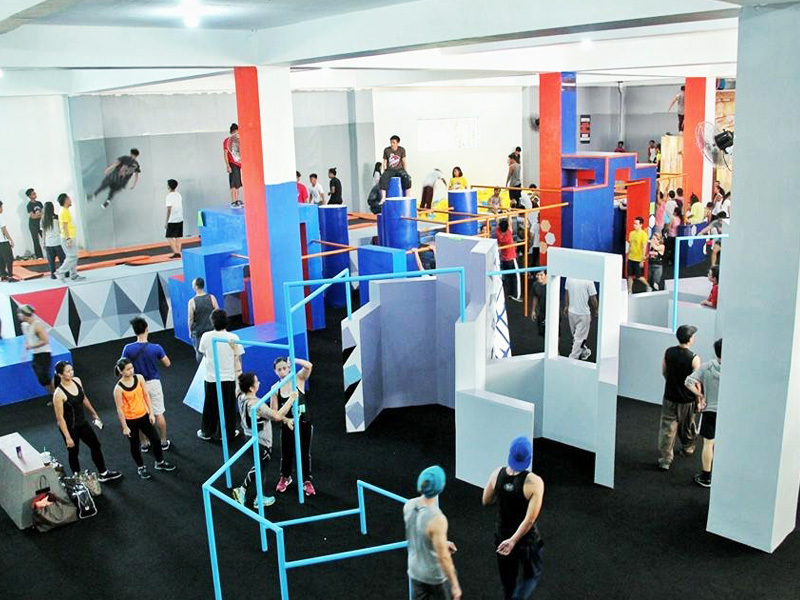 In the first parkour facility in the metro, you get a chance to test your ninja skills and reflexes – jump on walls, do your flips, and run through courses and obstacles. It’s certainly a fun way to exercise. The first premier archery range in the country, Gandiva Archery Center is a 380-sqm facility that lets you play as Katniss Everdeen, Princess Merida, or your favorite archer in real life. Learn how to shoot arrows and hit the bull’s eye through its workshops and classes. These parks and facilities, while they may all have different activities to try, possess one common requirement: have fun. But, before you jump into trampolines, dive into ball pits, or swing on a trapeze, remember to learn all about their safety procedures. It doesn’t hurt to ensure that you’re out of harm’s way on these parks. Have fun and make the most out of your summer! Do you have anything to add to this list? Let us know by commenting below.